There are many benefits to participating in undergraduate research. In most cases, especially in STEM fields, writing a research thesis is a requirement for graduation. Moreover, it’s necessary for a strong application to graduate or medical school. That said, there are many aspects of choosing a lab that can be quite nerve racking. In order to avoid common pitfalls on the path to a thesis, students should be aware of the most important aspects of this process. It doesn’t matter if you’re a bright-eyed, bushy-tailed freshman who knows exactly what research you want to do, or you’re a spring semester senior whose research is inducing a quarter-life crisis. Your mentor is basically a giant, walking bag of wisdom. They have knowledge and resources to guide you onto a path that best suits you. It should be noted that your mentor might not be the same person as your lab advisor/PI! In essence, a mentor can be any professor you can trust for their wisdom and sound advice. The best way to make an informed decision on joining a lab is to start looking early. Organize yourself! Make spreadsheets. Make lists. Make blueprints if you must! Don’t forget to consider other universities in the area when making your lists. Maybe you attend a small, liberal arts, women’s college (as I did). 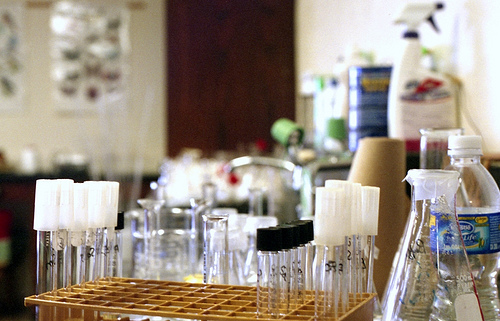 Maybe your college only has one neuroscience/ organic chemistry/materials science lab. Realize that professors want to work with people who want to work with them. Feel free to search at nearby schools, hospitals or pharmaceutical companies and make your interest known to a researcher there. Other considerations include: the time that it takes to get to lab, whether it’s a paid/unpaid position (and if that matters to you), the time needed for the type of research (and whether that can fit into your schedule), and if you need school credit for research. This step can be surprisingly difficult. You’re an underclassman. You’re smart. You have options. You can get into labs doing a wide range of things. It can be challenging to know what your passion is without much experience. Discovering a passion may come by chance, or by fierce searching. Either way, you only get it through trial and error. Don’t be afraid to take risks. Don’t be afraid of dead ends. To stay on track in the meantime, ask yourself: Am I joining a lab that studies hamster mating rituals because my mom wants me to be a zoologist? Would I rather be somewhere else? Where would I rather be? Remember to be honest with yourself (it saves time!). This step is by far the most important part in choosing a lab. I’ve heard it said that getting along with your lab boss is more important than the actual project you’re doing. This means you need to chat (i.e., email them, then meet in person) with multiple researchers, tour their labs, become familiar with their publications, and interact with their technicians, undergraduates, and graduate students. Throughout the “visiting” phase try to be actively engaged with people, and ask good questions! It’s recommended that upon the first meeting with a researcher, you ask if they’re accepting new students. This can even be done via email before you meet in person. This way, you can narrow your search from the very beginning. 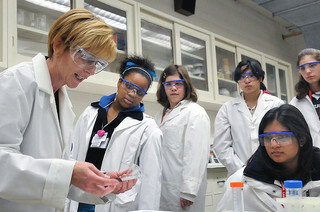 If, after touring a lab, you feel that it’s the place you want to be, express your interest to the professor. Don’t worry if you feel nervous asking a professor to take you in. This is surprisingly similar to the feeling of asking someone on a date; if you have sweaty palms, a shaking voice and an acute sense of dread, then good! You’re taking chances and learning! In short, here is how asking to join a lab should go: meet with the PI in person, say to them that you want to join their lab (bring up why you’re interested in their research, and what you think you’d contribute to the lab team), and wait for a response. Don’t take it personally if a professor turns you down. Research funding is very tight nowadays, and a professor may turn down a student for no apparent reason, when in actuality they simply don’t have the funds to support one. Don’t forget that many research universities offer summer internships for rising junior and senior undergraduates. These (usually ten week) programs offer extra research experience in various STEM fields. Click here for the NSF website linking to universities with REU (research experience for undergraduates) programs. And make sure to check out summer research opportunities at Penn State College of Medicine! If you are an undergraduate student and have a question for our “Ask a Scientist” feature, please e-mail Lions-Talk-Science@psu.edu and we’ll address it in a future post! A post by me from Lions Talk Science!